Well, maybe my quick grip clamps are not gathering dust, but they are definitely not getting used near as much after purchase a few of these. I bought 3 of the 40” versions to supplement other clamps on a very large glue. They quickly became my go to clamps. Unlike my other bessey parallel clamps, these have a nice large rubber handle that make it easy to really twist and lock down on a piece. I’ve yet to have any issues with flexing with them either, but most of the work I am doing does not require the sort of clamp pressure that might torque a clamp. The one instance where I did put some serious torque on these, I did not notice any flexing, and that was smashing a #20 biscuit into a #10 slot! Another reviewer mentioned the heads not having a stop on them causing them to slide down the bar and crash into the end. I will freely admit that is definitely annoying and keeps me from giving these 5 stars. I also wish that the clamps came with more than 2 of the little leveling feet. 2 feet is plenty for a 12” clamp and a couple small boards, but for larger work, a few extra would be nice. Yeah, agree in all respects. I have 6 of them, 4 in 50” and 2 of the 40”, and I really, really NEED more. I was glueing up a bench top and just didn’t have enough. My aluminum bar clamps and pipe clamps were helpful, but not as much as the K body Revos. One more annoyance = sometimes the clamp wont start to grab unless you squeeze the aluminum bar that the handle threads through to the bottom jaw. You screw in and screw in, but it doesn’t clamp. But the problems are small, and the usefulness of the clamp is so large that I really NEED more. I have some older 60” Bessey K-bodies as well, and these are far and above better for me. Personal preference may come into play I suppose though. I have 4 – 24” ones and I love them, can be pricey but definitely worth it. Great clamping pressure and as mentioned, no flexing. When I need longer clamps for bigger glue ups, these will be my first choice. The clamps are supposed to come with a stop clip. If yours are missing contact Bessey for a replacement if you explain to them they were gone when you got the clamp they may even give them to you. This clamp can be removed from the bar to turn the head around or to gang more than one clamp together for extra long projects. I am a large guy with above average build, and i have probably over clamped things…. and there has never been any flex (like other style) or no flex that i have been able to see. (i havent put the straight edge on the bar during a clamp up….. but these are amazing clamps!!!! Here’s my collection of Bessys…from 12” to 60”....I have around 30, and have added a few more since this pixs was taken in the shop….. I picked up some Jet clamps at Christmas. [email protected] 24” and 4 @ 40” with the risers. They were on sale for $198 which was too good to pass up. I have the bessy’s too but I like the jet better. Maybe it’s just me, but I have yet to find a better parallel clamp than the Jorgensen cabinet master. We are talking about 2 different classes of clamps. Each of these is designed for a specific type of work. If you are not using the Quik Grip clamp as much you were probably trying to use it for the wrong job. They have their place and that is clamping things that require one hand to close them. That is hard to do with Bessey or Jet clamps like you are touting. It is hard to get lots of pressure with the Quik Grip clamps. Different designs for different jobs. I have a couple of these clamps…they work great, but I prefer Jorgensen clamps, their smooth bar is a lot easier to scrape glue off of than Bessey’s serrated bar…. I find some people’s responses to reviews pretty entertaining. It’s like they’re personally offended if you give a good review to a product that is not their favorite of the item! I do appreciate the constructive conversation. 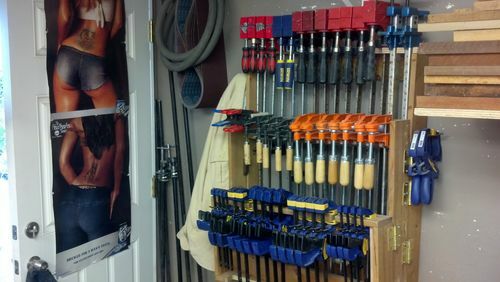 I think I need to track down a jorgensen and jet clamp to give them a try, they seem to be quite popular as well. Did you know that “Bessey” is pronounced “Bess-Eye” and not “Bess-eee”? It’s a German company and that’s how the German’s pronounce it. There is a promo on You-Tube which shows the steel factory (yes, they own the factory that makes the steel, or rather the steel company got into the clamp business) with a nice UK english commentary where the guy correctly pronounces “Bess-Eye”.